The KLIK 3 digital metering system is an accurate and cost effective solution for measurement and display of all major electrical and power quality parameters. 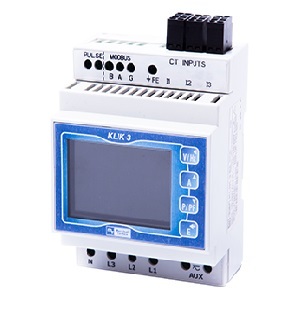 Its easy programming, mounting and user-friendly navigation make the KLIK 3 an ideal choice for customers who require reliable energy measurement. The KLIK 3 is built to high quality standards in the UK and utilises the latest microprocessor and manufacturing technology. The product features a DIN-rail enclosure, backlit LCD display and user programmable CT ratios, all accessible via an intuitive user interface. KLIK 3 measures 17 electrical parameters including total harmonic distortion (THD) measurement up to the 31st harmonic.